If you're looking for a compact external graphics card dock with basic expansion options, the Sapphire Gearbox will be right up your alley. Gaming isn’t restricted to big, bulky PCs anymore. The rise of USB-C and Thunderbolt 3’s blisteringly fast data transfer speeds can now transform ultraportable laptops and diminutive desktop systems into full-blown gaming rigs when they’re connected to an external graphics card dock (eGPU). PC makers have been scrambling to meet the demand for this new hardware category. Today we’ll be examining the Sapphire Gearbox, the latest eGPU contender to throw its hat in the ring. At $339 MSRP and initially offered at $259 at Amazon, the price of Sapphire’s debut graphics dock is certainly right. The Gearbox even offers handy features you don’t normally find in this price range. Sapphire has a winner on its hands. The Gearbox ships in a nondescript brown box, and the hardware itself is nicely designed without screaming “look at me!” The aluminum exterior wraps around the top and sides of the Gearbox, with perforated mesh on the left edge to let the hot air from your graphics card exit the case, augmented by a gap between the top surface and the fans underneath. The front and rear of the Gearbox are black. A single horizontal blue LED strip classes up the front of the case, over a power button and a discrete Sapphire logo. 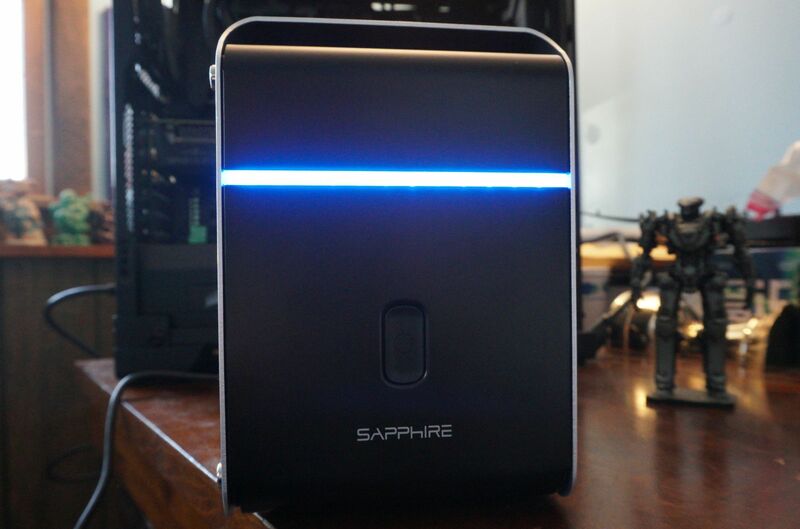 It looks nice on your desk, sitting pretty next to dark PCs and aluminum MacBooks alike thanks to its color scheme, and Sapphire’s enclosure fits in a surprisingly compact footprint. At 11.8 x 5.43 x 8.03 inches, the Gearbox is noticeably shorter in both length and height than the $500 Razer Core V2 and $325 Akitio Node, albeit a wee bit fatter. If space is an issue, be sure to check out the Gearbox. 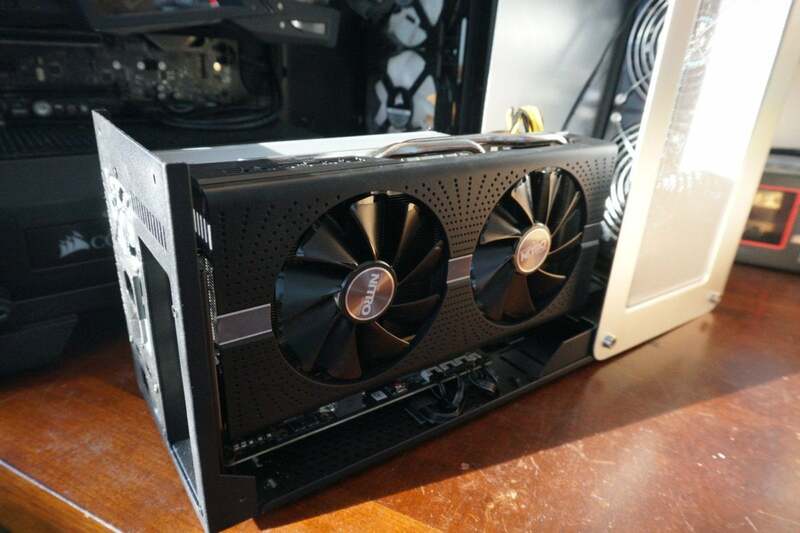 We tested the eGPU with the 8GB Sapphire Radeon RX 580 Nitro+. 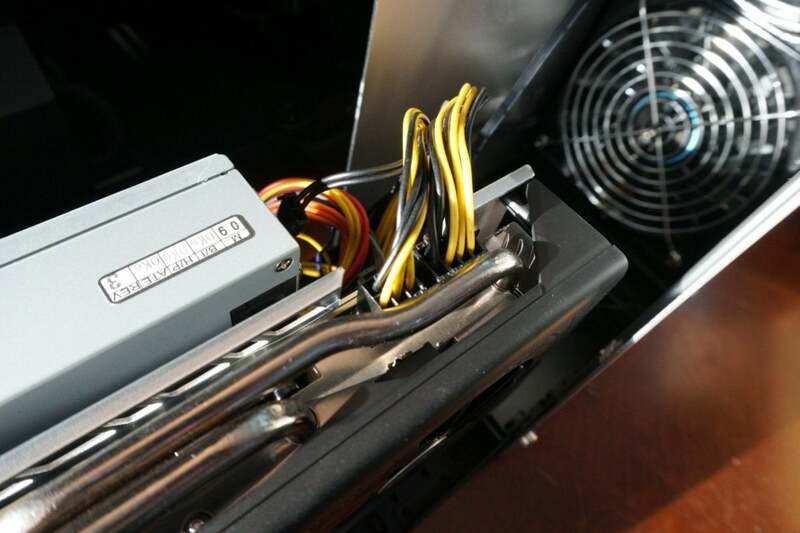 You’ll still be able to fit most—but not all—graphics cards inside the Gearbox, however. The eGPU dock supports dual-slot graphics cards up to 10.5 inches long and 4.5 inches wide, a.k.a. standard graphics card sizing. 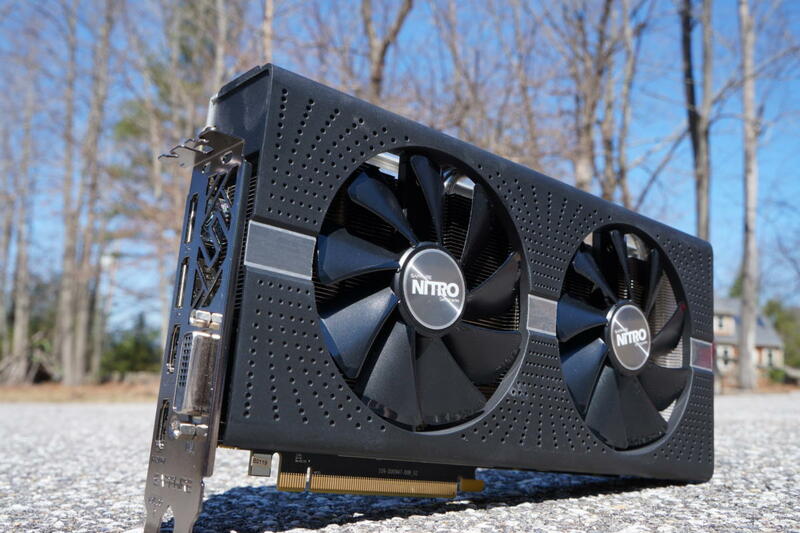 It’ll take everything but graphics cards with the biggest, beefiest coolers, including most midrange GPUs (like the Radeon RX 580 and GeForce GTX 1060) and many higher-end AMD Radeon Vega and Nvidia GeForce RTX 20-series GPUs. The Gearbox also supports professional graphics cards, Sapphire says. 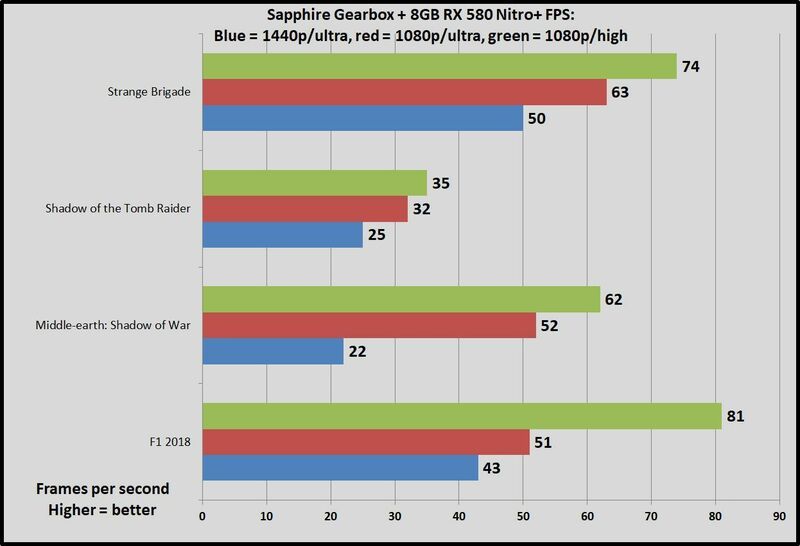 Although only Sapphire GPUs up to the 8GB RX 580 Nitro+ are listed as compatible with the Gearbox on Sapphire’s website, any other graphics cards that physically fit inside the system and stay within the Gearbox’s 300-watt board power limit should work as well. The Gearbox’s power supply packs dual 8-pin power connectors, which makes it compatible with all but the most demanding, heavily overclocked enthusiast graphics cards. You’ll have no problem slipping Radeon Vega 56 and even Nvidia RTX 2080 Ti GPUs into the enclosure if they meet the space requirements. Reference versions of the Vega 64 ship with a 295W TDP, or just below the Gearbox’s 300W maximum, so you’ll probably want to skip loading the Gearbox with an overclocked version of AMD’s flagship GPU. While the Gearbox’s graphics card power tops out at 300W, the enclosure actually comes with a 500W supply. 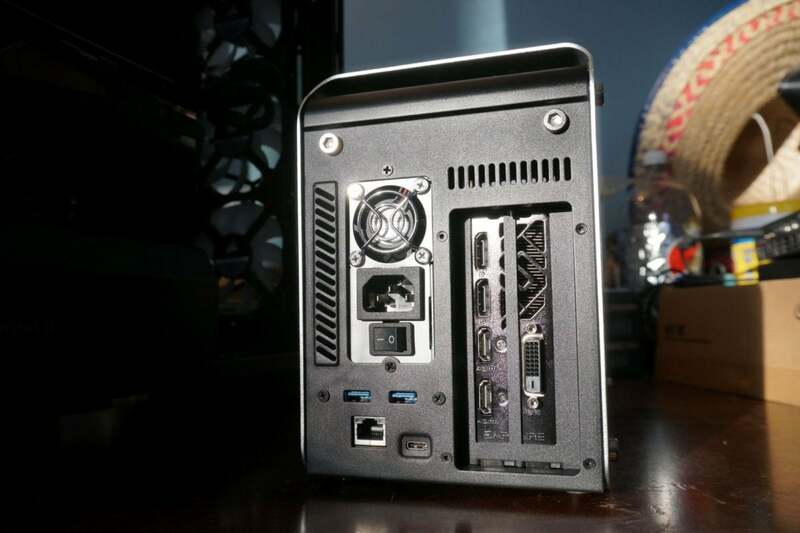 The extra juice goes toward powering the dual fans inside the box, the LED strip in the front, and the pair of USB 3.0 ports found on the rear of the Gearbox. They sit next to a Gigabit ethernet connection and the obligatory Thunderbolt 3 port that serves as the secret sauce for eGPU setups. Those extensions help the Gearbox double as a basic expansion dock for connection-limited systems like Apple’s modern MacBook lineup. They’re a rare find in external GPU enclosures in this price range. As a cherry on top, the Gearbox’s Thunderbolt 3 connection delivers Power Delivery Charging up to 60W, so your laptop can charge up while you’re gaming. Win-win! Setting up the Sapphire Gearbox couldn’t be easier. The illustrated manual shipped with the dock walks you through the process step by step. You’ll want to pay attention to that guide during the initial setup, though. The Gearbox comes studded with 10 hex screws on its edges and rear, removable with an included hex wrench. (The Akitio Node Pro and Razer Core V2 boast tool-less installation designs.) But you only need to remove four of those ten screws to open the Gearbox; if you take out the others, the enclosure’s various components fall apart, which I proved in the name of science. Fortunately, it’s easy to line everything back up and get the Gearbox back in working order if you make that mistake. Once you remove those four chosen screws, the Gearbox’s side and top lift forward, granting you access to the interior. Slipping a graphics card into the PCIe slot is as easy as it is in a motherboard—easier, even, given that you’re working in a more accessible piece of hardware—and connecting the power pins (if necessary) is straightforward. You can’t mess this up, though you’ll need to be careful closing the lid again, as there’s some wiggle at the pivot point and you’ll want to make sure the screw holes line back up. As a nice extra touch, Sapphire includes a vertical GPU bracket with the Gearbox to help support your graphics card’s weight in case you buy a particularly hefty model. 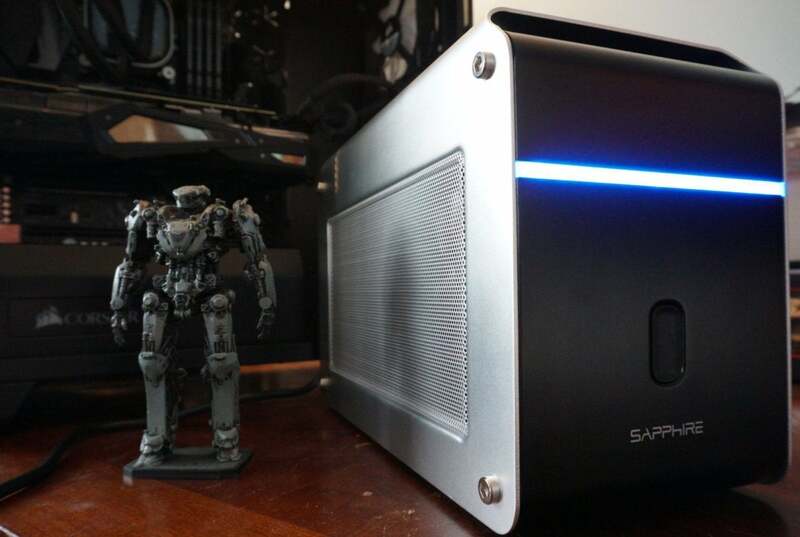 After making sure I’d installed the latest AMD Radeon drivers and the most current Thunderbolt drivers available for the “Skull Canyon” NUC I used to test the Gearbox, the PC recognized the Sapphire Radeon RX 580 Nitro+ immediately after powering on the enclosure. After rebooting the system, everything worked as expected. Because the Skull Canyon NUC includes integrated Radeon Vega graphics, I needed to manually adjust the graphics output from that to the Radeon RX 580 before starting my first game, but the external graphics card remained the default in games I booted up afterward. The Gearbox and Sapphire 8GB Radeon RX 580 Nitro+ deliver great gaming results with all graphics options cranked to Ultra and temporal anti-aliasing enabled at 1080p resolution, and soared past 60 frames per second in three out of four games when I dropped graphics settings to High. (The fourth game, Shadow of the Tomb Raider, is notoriously demanding.) These are all newer triple-A games, so color me impressed. While the Radeon RX 580 is capable of High-level 1440p gaming in proper desktops, you’ll want to skip it with this setup. One small note: The Gearbox’s power supply and fans aren’t loud under load, but the enclosure’s noise is somewhat high-pitched. Not annoyingly so, but it’s noticeable when you’re navigating menus and whatnot. It’s not quite perfect, but Sapphire did an outstanding job with its debut external GPU dock. The Gearbox is compact, nicely designed, supports a wide range of graphics cards, and—most importantly—unlocks gaming experiences that simply aren’t possible without hardware like this. 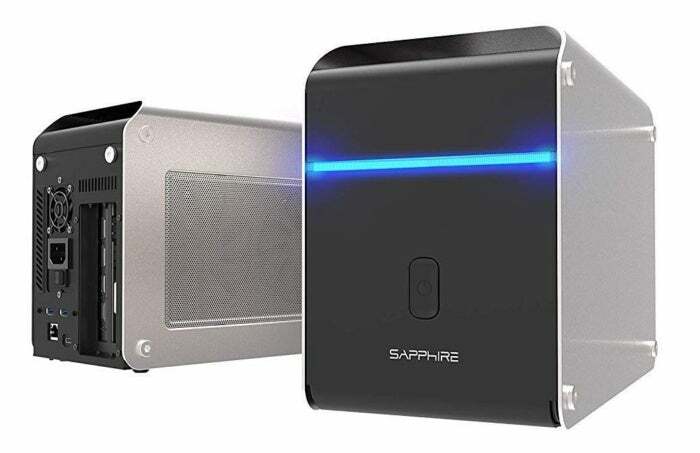 Sapphire helps the Gearbox stand out from the masses by including an optional graphics card bracket and additional ports that transform the enclosure into a basic expansion dock for laptops—features you don’t often find in eGPU docks in this price range. The Razer Core V2 packs twice as many USB 3.0 ports, but at $500, it costs a whole lot more, too. At its $339 MSRP, the Sapphire Gearbox is well worth your money. And if you can find it for $259 on Amazon, it’s a borderline steal. If you're looking for a compact external graphics card dock with basic expansion options, the affordable Sapphire Gearbox will be right up your alley.